Some people know this as the Seasonal Affective Disorder. It's some nonsense about being depressed in the winter. But for me, I can’t wait for SAD. In fact it's actual one of my favorite times of the year. You see, SAD is my Seasonal Alcoholic Disorder: That fabulous time in the Christmas beer season when all those great Winter Warmers and Christmas beers are consumed. Traditionally SAD usually starts with our Popcorn and Cranberry Stringing Party on December 23rd. In more recent years SAD started on my last day of work and always carries through until I have to return to work, usually after the New Year. This year SAD started last night December 18, 2009 when I got home from work. You see, I am fortunate enough to have vacation from now until January 4 when sadly SAD ends and I have to return to work. Probably with a few day's of detox. I’ve been trying to be a good boy during Advent and not drinking as much beer and such. You know the little Lent that is the Advent Season. I know that I have almost a full week left of Advent but when it’s your last day of work until after New Years, well, you can’t help but be a little SAD. SAD also has an added bonus, a real medicinal one, honest. You see, it’s tough for those germs to get hold of you if you maintain a sufficiently high blood alcohol level. Now a popper SAD just doesn’t happen it takes considerable organization and restraint to pull off. You know, proper stocking of the beer cabinet and not starting SAD before you are ready. What? you don’t have a beer cabinet? You really should look into that. My SAD preparation started in November this year. Although the Thanksgiving Bier Dinner was going to put a dent in my beer cabinet I quickly recovered when State Line had a sale of Belgians. Just in case you were wondering, SAD is not just consuming beer. It is quite permissible to start the SAD day off with Jack Daniels in you coffee. Then any alcoholic beverage during the day, and of course some home made Eggnog for those special Christmas parties. Plus I always have a batch of my grandmother’s medicine on hand; equal parts of Lemon Honey and Whiskey, well I’m not so equal with the whiskey. It’s good for a cough and it makes a nice little tottie in the evening or anytime for that matter. So here is what the beer cabinet looks like today. Well, last night since I already started my SAD. Oh Yeah! It’s going to be a great SAD this year. I'm not sure if it's as full as it was last year but in addition to what’s in the cabinet I’m getting a 1/6 keg of Saint Bernardus Christmas Ale for the 23rd and Christmas Eve Parties. Here is a better look at the top self. I won’t bore you with descriptions of most of these beers but I do have to mention the Samichlaus Bier. This is unique Austrian Bier that is only brewed once of year of the feast day of St. Nicholas, Dec. 6. It is then aged for 10 months before bottling. It comes in a whopping 14%ABV, a SAD delight. We also have one that John Jr. has been aging, it was bottled in 2006. Here is a better look at the middle shelf. 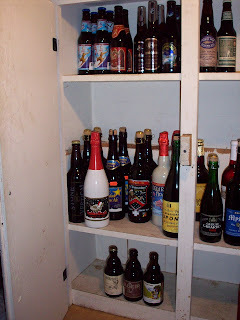 Most of the middle shelf are Belgians or at least 750ml bottles. 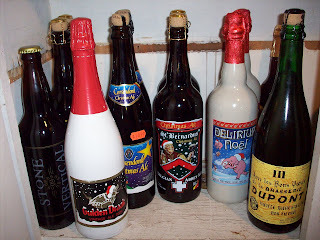 Currently I have a Golden Draak, 2 Corsendonk Christmas Ales, 2 St Bernardus Christmas Ales, 2 Delirium Noels, a DuPont Christmas Saison and a few more odds and ends. 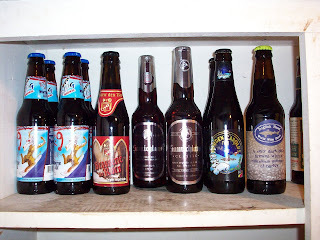 The bottom shelf has a few very special Belgians, imported by 12 Percent Imports; one of which was our Thanksgiving entrée bier, La Botteresse Brune; "Thanksgiving in a Glass". 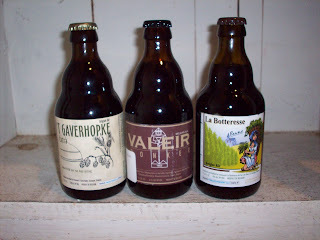 I will try to review most of these beers as my SAD progresses. Plus I still have a few beers from Thanksgiving in the Beer Frig, What? You don't have a Beer Frig either? And you never know what Santa may bring. I know we still have a week of Advent left but I hope you all have a Very Merry and Blessed Christmas and A Happy New Year. And remember a little SAD never hurts.